One of the most common questions tarot readers get is along the lines: should I keep doing what I'm doing, or change the plan and do something else? 8 Swords, Rider Waite Smith tarot. Often in life, when we've been putting in a lot of effort on something, it feels unbearable to think that no fruit came of it. Changing a plan feels like a failure. We often don't feel at ease to quit studies, change careers, change partners or cut out friends, even when it feels there's nothing but roadblocks. The feeling of a roadblock is real, but here's the catch: the roadblock itself is not. Tarot card 8 Swords symbolises a situation where we can't see a way forward. We're so set on one course or one thinking pattern, that we don't realise nothing else but our own worries, assumptions, expectations and beliefs are stopping us. There's always a choice - a different choice. 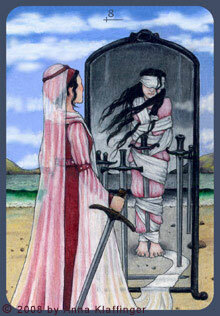 8 Swords of Anna K tarot shows, how the feeling of being trapped is just a projection or illusion. 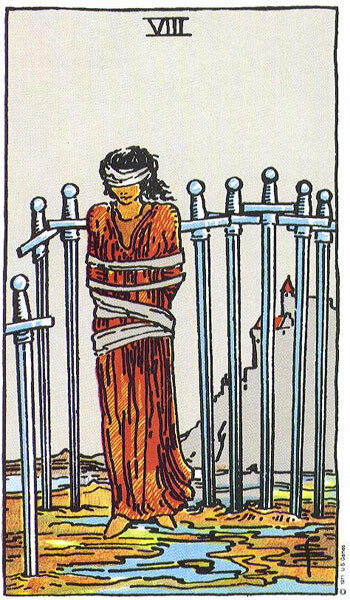 The person is free, holding a sword - symbolising power, knowledge and clarity of thought - but she believes she's trapped. In reality, nothing but her own thoughts are keeping her captive. I once read that an average person makes thousands of choices every day without counting them. We decide whether to get up or not. Whether to have breakfast or not. What to have for breakfast? What to wear for work? To go to work at all or not? Do some pilates before work or not? Catch a bus or drive? Start with task A or task B? Have a chat with Bernie or Bonnie? Leave early or stay late? Shop at Fresh Groceries or Fresh Produce? Send a few job applications at night? Sign up for couples' counselling or not? Now, usually it feels that these are not actual choices. Many are self-evident, automated motions we have to carry out to simply live life. But, from a philosophical point of view, they are all choices. And if we chose differently, our day and life would be different. 8 Swords is the mindset where things happen and thoughts are thought, because that's how it's always done. But technically, we could NOT go to work. NOT talk to Bonnie the Boss, but Bernie the Jovial Friend. NOT go shopping at all but drive to Vegas to spend all our money, never come back and forget our job and marriage troubles forever. Maybe not the best decisions, but decisions and choices nevertheless. And if any of the daily choices are different than usually, the day is different and can gradually produce a different life, when changes and different choices accumulate. To wind back to bigger life choices. How to know when a change of plans is in order, and how to encourage oneself to take that step? It can feel daunting to admit that nothing came of this field of studies, career, or relationship. What will everyone else say? How will I be viewed? How can I justify to myself or others I've spent so much time on this, and now I've got no results to show? 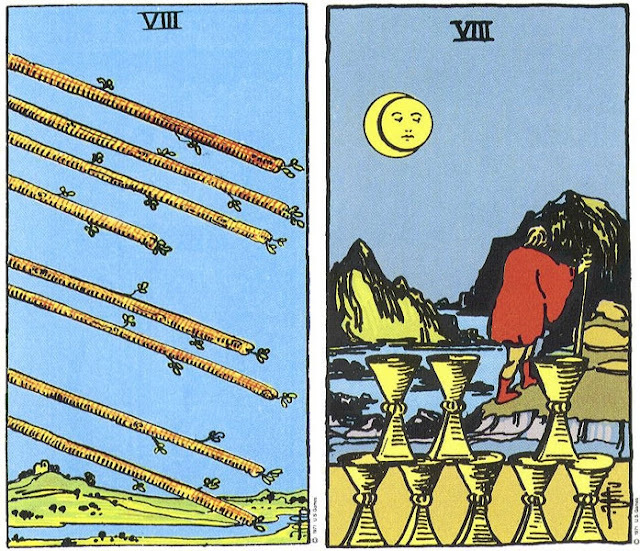 This, again is the 8 Swords: feeling trapped due to thoughts. Thoughts are only mental constructions and ways to see the situation, and they can be changed: negative, limiting thoughts produce trapped behaviour; whereas positive, expansive, curious thoughts produce new choices, new plans, new vistas. I used to do a lot of knitting and that was a hobby that thought me the necessity of sometimes going back and fixing things from the root. If I made a mistake with the pattern, it could not be patched up later on. My creation would very visibly show, almost radiate the fact there was an error. I often had to undo what I had knit, unravel perhaps an hour's work. What a pain. And yet, it simply had to be done to get the best result. If I'm putting a lot of effort into something, why accept grade C quality? Life is a lot like knitting. We try to create something the best we can, sometimes we follow a pattern, sometimes we wing it, but in every case, if there is a mistake made or wrong turn taken, we might need to humbly go back and do it again - change course, no matter how late it feels. Nobody excels at living and nobody's life is error free. So let yourself out of the mental jail and stop judging your earlier choices; more importantly, stop listening to anybody who judges your choices. If something needs to be changed or fixed, don't be afraid of unravelling. What you build next can be much better. At least it's different, and a source for different lessons. Here's a spread that can help (pull 1-3 cards for each question depending on your preferences and skills). When and how to change plans? What in my life needs to change? To what direction should the change be? What action to take to change it? What have I learned from going through this path until the change? What in my life needs to stop altogether? What in my life needs to start? Tarot cards 8 Wands and 8 Cups symbolise taking action (or communication); and realising that something does not bring joy any more or won't become fulfilling, no matter how much we try. So, it's better to move on and take action to change plans.